When I'm sick, in pain, under duress or simply exhausted from lack of sleep or overwork, I can become a snappy, irritable gal. It's not my intention during those times to react harshly to those I love, but sometimes I do. 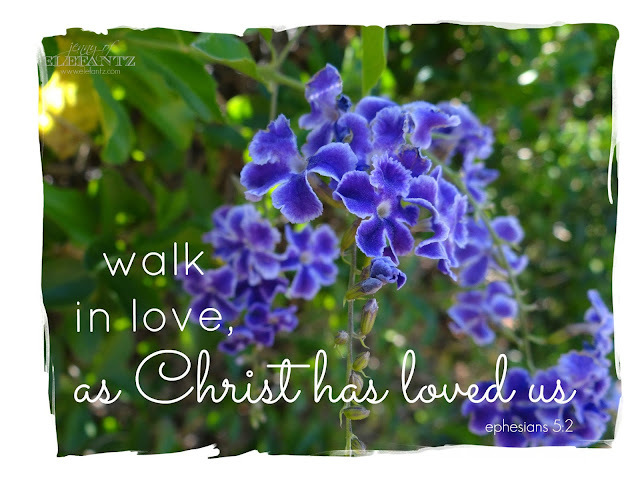 I love this verse, walk in love. So what needs to change for me to be that loving example of Jesus? It's not my attitude because I believe wholeheartedly that I should walk in love as He loved me. I guess then, that there's an underlying cause of my harsh responses which must be examined in order for there to be a change. Sickness and sleep - sometimes there's nothing I can do to alter sickness, but keeping myself healthy with a fresh food diet and some gentle exercise every day, regular restful sleep patterns and time in the Word, will strengthen my immune system, bring wisdom to my state of mind, and build my spiritual muscle. The end result will be less illness, stronger immune system, and a calmer, more refreshed and caring Jenny. Physical exhaustion - I push myself too hard with work at home and work in my business, forgetting to apply the brakes before I crash and burn out. Just because I can doesn't mean I should. Pacing my energy in the hours I have each day would be far wiser than running till I drop. Simplifying my home and work responsibilities is something I've been working on lately and already I see (and feel) an improvement in my breathing, sleep, and how I respond to important issues with the people around me. I expect an even greater improvement in the months ahead if I continue to make positive changes. It's important to address our spirit and the sin within when we struggle to walk in love, but don't forget to assess your physical health as well because unless we have a caring and nurturing spirit/body balance, walking in love may continue to be a uphill climb. I have a hard time slowing down. Sometimes I feel like there's only so much time left, and I have to use every minute. Then I do wind up too tired, so this is a good reminder to relax more, emulate my Savior, even toward myself. Thanks, Jenny. You always have such a nice, wise word. Great advice, Jenny, I needed to hear this. Blessings to you. Good Morning Jenny! These are wonderful words to live by. Yet, as you have described in your own life it can be difficult to achieve unless we really stop and look at the way we do things as a whole and change the entire way we do life making each step we take improve our entire being and life around us. Hubby and I have been working on this since we met and began our quest to improve my health problems and the way my life made it worse. Changes are especially hard for me in many ways, but with the strength of the Lord and the Love of my Hubby we have achieved a pretty great success. Of course, things come up and as we get older other adventures occur that have to be adjusted accordingly, but again with the Lord as our "BackBone" and "soft bed to lay upon" "the Strength of being able to talk to endlessly and his word that leads us" it all falls in place. Thank you for sharing and caring each and every day! Have a fantastic creative day! Hello Jenny, your honesty is refreshing and encouraging to others.......the most important thing is to pace ourselves. We can be hard task masters to ourselves at times. Sometimes things just have to wait for tomorrow! Sometimes we learn that the most important things, aren't actually 'things', but people. Blessings coming your way. Life is a precious gift that God has given us. We have an obligation to care for him. But ... women tend to take care of so many other lives that we forget our own :). No need to feel bad about it. Just remember occasionally. :) Hugs. You know the old saying take time and smell the roses. We all have obligations but our physical and mental health are important. I think we all tend to push the limits when we should slow down.